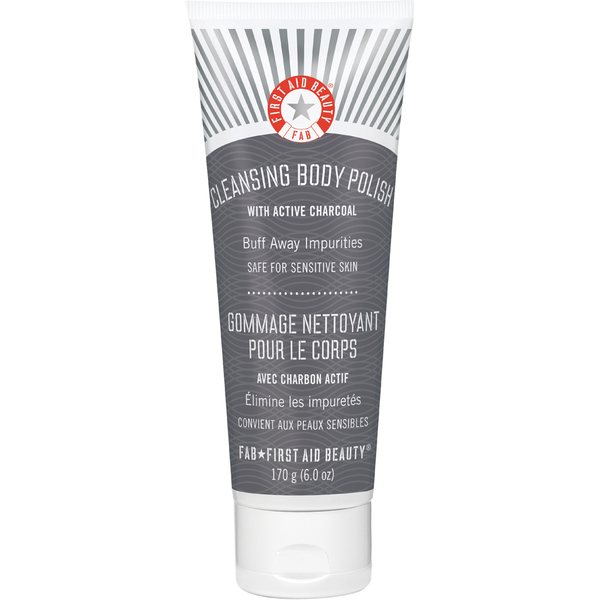 Achieve silky soft skin with First Aid Beauty's Cleansing Body Polish with Active Charcoal; a skin-refining formula developed to cleanse, exfoliate and smoothen the body from top to toe. Fortified with Active Charcoal, its innovative formula forms a rich foam upon contact with water to gently buff the skin's surface, eliminating dirt, impurities and dryness without stripping moisture or uncomfortable tightness. Deeply invigorating, its nourishing cocktail of Argan Oil, Honey and Liquorice Root Extract diminish dead, dull skin cells and roughness to reveal refreshed, revitalised skin with a healthy-looking glow. Safe for sensitive skin. Apply product to wet skin and work into a lather. Rinse off completely. Use daily or as needed. Aqua (Water, Eau), Bentonite, Disodium Laureth Sulfosuccinate, Montan Cera (Montan Wax, Cire de Montan), Cocamidopropyl Betaine, Kaolin, Sodium Cocoyl Isethionate, Glycerin, Mel (Honey, Miel), Salicylic Acid, Charcoal Powder, Lactic Acid, Rosmarinus Officinalis (Rosemary) Leaf Oil, Argania Spinosa Kernel Oil, Linum Usitatissimum (Linseed) Seed Oil, Tocopheryl Acetate, Chrysanthemum Parthenium (Feverfew) Extract, Camellia Sinensis Leaf Extract, Glycyrrhiza Glabra (Licorice) Root Extract, Vanilla Planifolia Fruit Extract, Caprylyl Glycol, Sodium Chloride, Phenoxyethanol, Leuconostoc/Radish Root Ferment Filtrate, EDTA.